Make money with video – yes video can earn money that too legal. Making money with video is developing the concept and given below are some of the ways to make money with video. There are already established channels that offer money for the video. 1. Some of the examples in this context include ‘cost per click’ (CPC). This process generates income when a viewer clicks the ad. 2. Another way of getting money is ‘paid product development’. This method provides money to the YouTube content creator from the sponsor and the purpose of the payment is to review a product or to feature it within the video of the sponsor or others. 3. 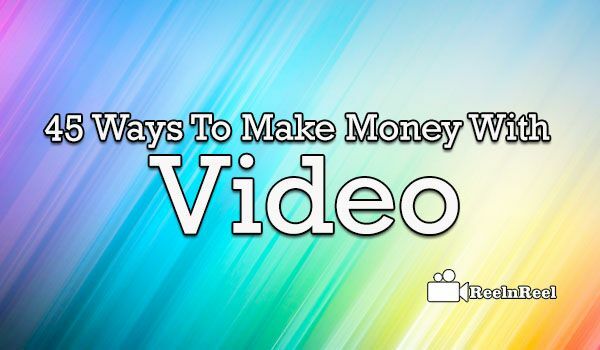 The process of making money with video is gaining popularity and given below are some of the ways to make money with video. 4. In this connection, one should be aware that the content should be placed on some of the social media so that the creator will be paid for his work. 5. Shooting documentaries are the first and foremost way to make money. 6. Work can be completed within given small budget. 7. Shooting live performances is another way. 8. Live performances attract the huge live audience as well as have the higher number of viewers (either live or recorded). 9. Shooting commercials give money to the creator of the owner of the product for which the commercial is made. 10. Shooting practical joke videos and placing them on established sites (specific to the content) attracts a number of viewers thereby enabling the creator to get money. 11. Depending on the selected site, the video can go viral and create an instant sensation. 12. Shooting training videos are ever increasing popular concept. 14. Training is a continuous process and hence the increasing popularity of this category. 15. Shoot television series/narrative movies give money through the television channel to the creator. 16. Shooting corporate promotional commercials will be specific to the concerned corporate and the creator is paid directly by the concerned corporate for his work. 17. Shooting corporate events is once again a hot cake. 18. People would like to re-see the video. 19. Shooting a reality show is channel specific. 20. As the concept of a reality show is gaining popularity, the creator can find huge money in shooting a reality show. 21. However, this content will give money only from the channel that is hosting the reality show. 22. The shooting of sports/kind games gives recurring views and thus gives recurring money for the creator. 23. With the increase in net usage by youth and kids, this segment got much more acceptability and hence more money for the creator. 24. The shooting of extreme weather conditions is an ever-green product on the net. 25. Videos like Tsunami, cyclones, typhoons, erupting volcanoes etc., get repeat visits and hence the creator is entitled to receive repeat money. 26. Shooting video resumes is another concept that can give money to the creator. 27. Present day resumes are having video content embedded and hence the creator can expect good money from the person for whom he is preparing the video resume. 28. The shooting of vacation areas can give money to the creator from the frequent travelers. 29. A ready reckoner video about the holiday spots and tourist places enables the travelers to obtain first-hand information on varied subjects on those places. 30. This is a ready money for the videographer. 31. Shooting for interior decorators is another business that is gaining momentum. 32. As the interior designer has to showcase his credentials, he is bound to engage videographer in shooting his work. 33. This gives money to the creator and this is a one-time payment from the interior designer specific for one work at a time. 34. The shooting of safety videos is equally good opportunity for the creator to earn money. 35. As the present world is craved for more security, people are ready to spend any money on safety tips and precautions. 36. A video containing this information is a hot cake giving huge money to the creator. 37. To make more money, monetize the videos with YouTube partner program. 38. If your video is on YouTube, you can show ads in your video and also alongside the video. 39. There are sites such as Inboxdollars that pay you money for watching videos. Be careful in choosing sites. 40. If you are skilled, you can sell your skills to those who want to create a video and make money. Provide good quality videos for getting more popular. 41. You can create intro videos or outro videos and sell them to those who require them. 42. Create the video to promote a product or product review. 43. Host someone’s video for which you have rights on your website and this is one way to make money online with videos. 44. Host Adsense for videos on your server and make money. 45. Hubpages, Dailymotion are few sites where you can publish videos and make money. Above are some of the processes where the creator of the video can get money for his work.